Finishing room is one place that is very risk to get fire. In the finishing room there are finishing material, such as stain, solvent and lacquer that are flammable Just a little spark of fire on the finishing materials is enough to generate a very big fire. The risk of fire becomes bigger with the existence of furniture products in the finishing room. Furniture products mostly made from dry wood that is also a highly flammable material. Once a fire occurs in the finishing room the fire will be big and very difficult to be stopped There are many stories about furniture factories which are burnt with the fire is started from that finishing room. You can view a story about it, in our article fire in a finishing shop. Therefore, the finishing room must be managed properly to prevent fires. 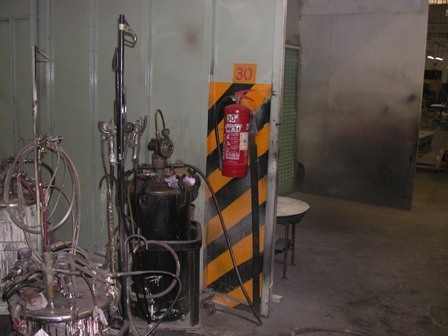 Fire extinguishers are standard equipment which should be available in a finishing room. Everyone who works in the finishing room must be given an understanding of the high risk of fire hazard in the finishing room. Here are some tips to avoid and anticipate the fire danger in a finishing room. Every people in the finishing room have to have understanding and awareness about the risk of fire hazard in the finishing room. Prevention is the best option in preventing the occurrence of danger. If there is a fire in the finishing room, it will be very difficult situation to be handled and overcome. It would be better if we can do preventive of the fires. Safety rules must be strictly and discipline implemented. For example there should be no smoking or fire lighting in the finishing room. And this would be more easily implemented if each person who working in it have a strong awareness about the dangers of fires in there. Take care the finishing room, keep it clean and neat. Often time the fire is out from unknown places or the causes is not known, it often occurs in a dark place, a dirty or untidy room. Goods which pile up and the pails or drum that is not correctly cover could lead to a dangerous problem if it is invisible. The rat or other small animal could cause big problem if we cannot detect them. Therefore it is important to keep the finishing room to be neat and clean. In the clean and tidy place if there is something wrong can be directly seen and known. Trash such as the used sandpapers or rags and dirty thinner should always be cleaned and removed from the room every time after work. The finishing materials such as stain, lacquer, sealer, glaze, etc. should be taken out from the finishing room and keep in the storage room every time after finish work. Fire extinguishers are standard equipment which should be available in a finishing room. Since the high risk of fire hazard then finishing room must be equipped with fire extinguisher in there. The fire extinguishers have to be in the placed that is easily accessible and viewed. Put a big and clear sign in that show where the fire extinguisher is. These equipments are needed to be accessible easily when they needed. Make sure also that these devices could function well if needed. Do a routine checks to the safety equipment such as extinguishers, hydrant, sprinkle and other tools to ensure that these devices can function properly when needed. Do the electrical circuit correctly. Electrical sparks is the one of the fire causes that often occurs. Therefore it should be carefully handled and installed. The electricity circuit should in the close line. It also needs to maintain regularly to keep clean. Electrical panels, sockets, switches and electrical appliances such as lights should always be cleaned to reduce the risk of occurrence of sparks due to electricity. Each barrel or pail finishing materials must be grounding to prevent electrical sparks from the static electric force. Grounding is the method of connect the materials with the earth, about the grounding you can view it more in : grounding in the finishing room. Do training program for all finishing peoples to anticipate emergencies. The disaster and emergency situation could happen anytime causes by many reasons. At the time when the disaster come the peoples usually get panic and can not do the right steps to anticipate the danger. To keep the peoples in there be able to handle the danger situation, they need a training program. There should be a firefighters group in the finishing room. There should be a regular training and exercise vigilance on the team so that firefighters are always ready to respond to the possibility of fire. While for other peoples in the room are need to be trained about the evacuation in the danger situation.